Just a quick post to tell you that, after Smarties Party's disappointing run last Friday at Ripon, the other three horses I have interests in all run this week... and an ex-Geegeez Racing Club horse also runs tonight. Anyway, Smarties Party - in whom I own a small share - has been a little disappointing recently but she'll be back at Sedgefield, where she won her only race, next time on May 18th. Between now and then, a quartet of current or ex-Geegeez / Bisogno equine interests contest races up and down the country. This afternoon, at 4.50, on the Norfolk coast (Yarmouth to be precise), Sail Home will carry topweight in a 0-60 contest with Adam Beschizza doing the steering. She's capable of winning in the grade and is going well at home, but... but... the ground is plenty firm enough for her. Indeed, if Adam decides it's riding genuinely firm in his earlier races, she'll not run. If she does, and she doesn't mind the hoof-rattling experience, she ought to go close. Then, later tonight, up at Sedgefield (7.45), former Geegeez Racing Club inmate and confirmed stroppy mare, Always De One, bids to break her duck in an amateur rider's handicap hurdle. Now trained by Ken Clutterbuck, there will be much for the Geegeez Racing Club mob to discuss with Ken at his Newmarket boozer on Saturday morning over bacon sandwiches should this one win or go close. In truth, ADO has something to find, but in a race where none of them can be especially trusted (with the possible exception of the Veronicas Boy), she might have a chance. First time visor is a negative for me, though. Then, on Thursday, I'll be at York for the Dante meeting. Night Orbit will be too, where he'll take on seventeen rivals including teammate, Blackmore, in the 4.45 race over two miles two furlongs. Greg Fairley again takes the ride after a fine performance in the saddle the last day at Pontefract (2m6f on the flat! ), and - whilst it's a Class 4 race, which is better than he normally contests - he'll definitely stay and the likely quick pace will be in his favour. Blackmore is a good horse. He's rated 75, which is fair, and he'll win more races this year. Obviously, there will be an interesting stable battle ensuing here, and the champion jockey, Paul Hanagan, can't hurt his chance. But Night Orbit has a decent each way squeak, and I'll be betting accordingly. Watch out for these and cheer them on, whether you back them or not. They need your support! Back tomorrow with a look at the York meeting. A short-ish post today, dear reader, to mention a few dispatches. One of my horse-y interests is running today at Huntingdon, I'm updating you on the results of the Betfair Conspiracy (what a hornet's nest that's proven to be! ), and I've got a spot of Thursday Fun to boot. First up, dear old Olly runs at Huntingdon in the 3.35 race. There's only five runners in a novice hurdle, but two of them are rated 140+, and trained by Messrs Henderson and Nicholls. My suspicion is that they might not go that searching a gallop, and that will probably find Orbit out. However, that said, I'd hope that he'd be able to nick third, with a bit of luck. Again, and mainly because I'm a hopeless romantic, I'll be backing him each way, but I couldn't really recommend the same to anyone else! Incidentally, and I wonder if they know, but a bizarre quirk of fate will see Orbit race against one of only three siblings from his mum's side. His ma, Dansara, has been a great mare, producing four race horses: Self Defense (high class hurdler), Dance World (won four races, including a hurdle for Julia, Olly's trainer), Olly himself (flat turf, all weather, and hurdle winner), and Sarando. Sarando opposes today, and he himself is already a hurdles winner from four starts. Good luck Olly, and - along with all the others - come back safe! Onwards, ever onwards, and although I wasn't planning to, I think I'll track the Betfair Conspiracy selections for a week or two. I've put the ones I've sided with up on the blog over the last couple of days, and will continue so to do for several days to come. (Note, we all know that such a microcosm is far from ideal in terms of system tracking, but it does serve a purpose for those who've purchased to compare their picks with mine - and they don't need to be exactly the same). Today, I'm going in with the 2.00 Huntingdon and, somewhat more contentiously perhaps, the 7.40 Kempton. For those following as users, I discounted the Hun 3.35 because of trip concerns; the Hun 5.10 due to fitness and trainer; the Sou 2.10 for fitness and track; Sou 2.40 collateral form (wouldn't have bet anyway, too short); Sou 3.45 because of the pilot / track; and the Kem 6.10 on form, or lack thereof. Conscious that that will mean little or nothing to most, I hope it adds some colour to the systems owning and paper trading minority. I'll also start to publish the cumulative results from tomorrow. One horse made late headway to finish 4th, beaten a neck out of the places yesterday, which was the only blot on an otherwise unblemished copybook. Take a look at the Betfair Conspiracy (and ignore the stupid sales copy) here. Jumps Racing is about… Jumping! Well,Â dear reader, as eventful race meetings go, Newbury on Saturday was up there with the best of them. And, as obvious as it sounds, it was the jumping that decided these jumps races. First up was my own (part) dear old Night Orbit, who was sent off a slightly unflattering 40/1 for the 2.00, a 19 runner 0-140 handicap hurdle. Hadden Frost came in the for ride, as AP McCoy decided he didn't want to take any risks ahead of his date with Denman destiny in the subsequent race. 'Olly' (as we call Night Orbit) was to set the pace, and Hadden had received his instructions from John (Julia's husband) and eight of us(! ): he was to make the running, not worry about Olly hitting a flat spot as he gets a bit lazy in his races, and keep asking him, because we know he responds for pressure. Off they went to post and - as the tapes went up - all was looking spot on for us. We'd worried that there might be competition to lead, but there wasn't so Olly and Hadden got their own way out in front. After a full circuit, and two of the three miles of the contest, Olly was still there in front, but with an ominously packing fields breathing down his neck, across his withers and all over his tail. It was at the eighth flight that possible triumph was supplanted by instant tragedy, as a bungled take-off by Olly led to an excruciating landing for Hadden. I've watch the re-run of this hurdle over ten times now, and I can tell you that our horse did his pilot no favours. He sort of 'forgot' to lift his legs at the obstacle - which he does occasionally do, because he gets so switched off in the race - and in the process of righting himself on the landing side, went down on his knees. The customarily imperious rhythm of horse and rider was sent into upset and, as Olly came up to the running position, so Hadden was still going down to the 'hang on to the horse's neck for dear life' position. 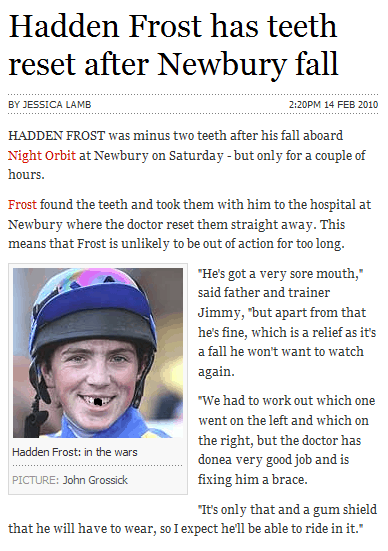 Alas, there would only be one winner of this difference of opinion, and young Frostie was catapulted from the saddle, and directly under the hooves of a peleton of the full complement of the remaining eighteen riders, at least six of which were in a direct - and uncircumnavigable (if that's a word) - line behind Olly/Hadden. The long and short of this long, short story is that Olly sustained a cut to one of his hind legs as another racer jumped into the back of him. Of course, it's usually no laughing matter when the partnership of equus racingus and homo sapians detaches, and it's a stark reminder of what these brave (foolhardy?) boys and girls do up to seven times a day for a hundred quid a throw. Get well soon Hadden, and I hope the chops are as sparkly in due course as they previously were. Now then, aside from my self-indulgent and meandering Night Orbit story, that was the nub of this post anyway. Those large fence like impediments between the start of a race and the finish are what prevent National Hunt racing from being Flat racing (with the exception of bumpers, natch). So, apart from the stamina to deal with the extended distances, horses require one other non-Flat attribute: the ability to rise at speed whilst lugging ten stone of humanoid and a smattering of lead and leather, and to land at similar speed t'other side of the aforementioned obstacle, whilst still transporting their cargo. Most do, and occasionally some don't. Night Orbit may have been the first to unglue his jockey, but he wasn't the last, and by no stretch of the imagination was he the most significant in 99.99999% of racing enthusiasts' minds, at least. That dubious honour fell the a certain champion jockey aboard a certain former champion 'steering job'. As has been well documented elsewhere, though from much the same source (such is the strength of the Press Association these days), Denman made a horlicks of the third last and then, excuse me, fair twatted the second last, giving McCoy no chance whatsoever. 1. Denman was not going brilliantly at the time of the first error, and McCoy clearly expected to be a good bit further in front of the virtually upsides Niche Market. A sound judge with whom I watched the race suggested Denman was emptying out, and may not have won even with a clear round. Whilst that's obviously moot conjecture, it is an interesting perspective from someone who is a fine reader of races. 2. It is of greater concern that, after hitting the third last, neither horse nor pilot were able to regather themselves sufficiently to make any attempt at clearing the second last. It's harsh to blame McCoy for this, as he'd have had to pick Denman up and lob him over to get to the other side. We've seen McCoy metaphorically do this numerous times, but Denman's a far bigger unit than most, and takes more lifting and - seriously - more knowing. This was a partnership that was still in the awkward 'not sure what to say to each other' stage of courting on the eve of Valentine's Day. 3a. Firstly, and - I hope - obviously, Denman was probably 75-80% fit yesterday. Paul Nicholls, his many times Champion trainer and Gold Cup trainer extraordinaire, would have left plenty (PLENTY!) to work on in the next four and a half weeks. He's always done that. Let's face it, the Aon Chase is not the Gold Cup, and there's no point winning at Newbury if it means not winning at Cheltenham. 3b. You can be confident that Mr McCoy will be spending a fair amount of time down in the Southwest, getting to second base with Denman: schooling the life out of him, and cementing their relationship. Remarkably, Denman is no worse for his calamitous howler at Newbury - which is more than can be said for the fence that he demolished - and, at 7/2 - he rates genuine value in my book. Look at the Gold Cup. Barring a complete surprise (which could of course happen), this is a two horse race: Kauto vs Denman. Kauto is rightly now favourite, as he seems to have ironed out the late race jumping blunders that were a feature of his early career (though he's still prone to the odd amateur leap). But 4/5? In the Gold Cup? Against Denman? If you're on already, fair play, and good luck. If you're not, there's only one horse to back for me. Denman has been less consistent, but his brilliant best - like when giving stones away and winning the Hennessy Gold Cup again - gives him the same solid chance in the Cheltenham Gold Cup as he had prior to the events of Saturday afternoon last. In my book at least. The totsport Trophy followed next, and for me it was as incalculably unfathomable as ever, my wager on Spirit River proving punting water under the bridge. For countless others though, it was easy-peasy, as nap hand seeking Get Me Out Of Here (how apt for AP McCoy who did the steering) duly completed the five timer, despite an error close home. He was sent off the 6/1 co-second favourite and, judging by the number of hollering Home Counties young adults in my environs, he was clearly a popular pick. With form figures of 1111, sometimes we (I) really do make this game tougher than it is! After the ad libbing of the Aon Chase, the Nicholls yard had another A List celebrity trying to get his lines spot on ahead of his curtain call at Cheltenham. This time, it was enter stage left for Master Minded, brilliant two time winner of the Champion Chase, and still only a seven year old. Master Minded has looking infallible prior to his last time out third behind Well Chief and one of Saturday's opponents, Mahogany Blaze. It subsequently transpired that MM had cracked a rib during that previous run, so it was easy enough to forgive him. What required slightly more of a leap of faith was backing him at 8/13 to show he was - if not back to his best - at least capable of seeing off these B-List and cult classic rivals. I backed him to win, as I considered him far and away the best form horse in the race, and also knew that he'd not be there if he hadn't fully recovered from his injury. I rarely back odds-on, but I considered Voy Por Ustedes to be regressive (see my horse-racing.ie Friday post), and the rest to be nowhere near good enough. Master Minded sauntered through the race, and was twenty lengths clear and laughing at the opposition approaching the final fence. And then, in classic Kauto Star fashion, he made an absolute hash of things. Ruby Walsh, who immediately took the rap for a particularly shabby presentation of the leading man at his big closing line, was bounced high into the air, and quite how he stayed on is beyond me. I'm bloody glad he did though! Even allowing for that loss of momentum and energy, Master Minded still cantered home by thirteen lengths from the reliable yardstick (but limited at top class), Mahogany Blaze, and has rightly gone odds on in the Champion Chase. This race, the Game Spirit, was crying out for MM to reassert his authority on the two mile chase brigade, and it'll take significant improvement from Kalahari King or any of the others to lower the hat-trick seeker's colours in four weeks from now. All in all, a thoroughly enjoyable, and eventful, afternoon at the races! Talking of afternoons at the races, I shall be boarding the 1123 rattler to Wolverhampton today, to witness the debut run of Geegeez Racing's new nag, Always De One. Lest you weren't aware, Obvious, our original filly, injured her knees whilst racing and, despite us giving her plenty of time to recover, she would have required medicating to race again. That carried a (far) stronger than palatable chance of her breaking down, and none of us wanted that. So, she's to be sold for broodmare duties, and we dipped into the reserve pot for a replacement. Step forward Always De One, an impressive looking specimen, claimed out of the Mark Johnston yard. She's taken a bit of time to grow into her sizeable frame and, in truth, her strong finish in a selling race last time - where she was just denied by an even stronger finisher - was her first real demonstration of track ability. 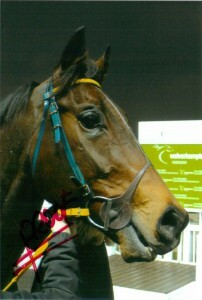 As you'll infer from the fact that we claimed her from a seller, we don't have aspirations of winning Group races! But then we never did. It's all about having some fun, and having a chance of a winner in the right grade. Today, at 3.40, Always De One takes on just three rivals. Although she's guaranteed to be in the first four (! ), the strong possibility of there being little or no pace is against her, as she needs a lot of stoking and outstayed all bar one last time out. Four weeks tomorrow until Cheltenham starts... I can't wait! https://www.geegeez.co.uk/wp-content/uploads/2018/09/geegeez_banner_new_300x100.png 0 0 Matt Bisogno https://www.geegeez.co.uk/wp-content/uploads/2018/09/geegeez_banner_new_300x100.png Matt Bisogno2010-02-15 09:56:382010-02-15 09:56:38Jumps Racing is about... Jumping! Yes, on Saturday at Cheltenham, in none other than the Grade 2 Relkeel Hurdle (previous winners include Black Jack Ketchum, Mighty Man and Lough Derg in recent seasons), my very own (in part) Night Orbit has been entered! 1. He is rated 38 pounds inferior to Zaynar, and probably has no chance of winning. 2. There is prize money down to 6th place, from a Â£42,500 race fund, and there are only eight entered - including one complete no hoper. If they all stand their ground (unlikely), we have to beat the plodder and one other. 4. I'm gutted I can't be there to see it! Moving on, and a quick word on Mick Kinane, who announced his retirement today. After many westward ho! wagers as a result of Kinane's misjudgments at the Breeders Cup over the years, I'm not a fan. But... his riding of Sea The Stars this season was impeccable, especially in the Arc where his rivals (human and equine) did everything they could to make it difficult for him. I salute him for that. And I salute him for his longevity - over thirty years at the top is hugely impressive. And, finally, I salute him for having the good sense to quit after what may well be his crowning achievement with Sea The Stars. Off to stud you go, Mick. Well done, even if you weren't always in my corner. Tomorrow, there's a lot of potential action so we should break the stasis, one way or the other! Another fairly packed post today, dear reader, with news of a new trial, a survey that I really hope you can help with, the last word on the weight for age debate, and a horse for today. First up, regular readers will remember that I asked if you'd be kind enough to help a lady who is doing some very serious academic research into online gambling habits. She's not trying to 'stitch us up' or anything like that. Rather, she's trying to measure the effect of gambling online, as opposed to other forms of gambling (physical casinos, lottery, betting shops etc). To aid her in her research, lots of readers (somewhere between 125 and 150 of you) were kind enough to offer thoughts when I asked previously. The reason I'm making this request again is because the research phase is drawing to an end, and this is the last chance Caroline has to get some more thoughts on the subject. Obviously the more data she can collect, the more meaningful and reflective the study will be. Caroline for her part has promised to share her findings with me, so that I can share them with you. It should make for very interesting reading. Next, I want to tell you about a couple of things we've been trialing here on the blog through most of May and some of June, and what's coming next. First, we'd been looking at a laying service called Lowlay, which had been doing rather well after an atrocious start. Kevin, who had been trialing it, was due to post his final review last Monday. But he's had an arduous week, having been diagnosed with a gall bladder problem. The offending item of anatomy (!) has now been removed and Kevin, I'm pleased to say, is on the mend. He's promised to try to do the review today: I've obviously told him that there's no rush. So hopefully that will appear on the blog later. If not, you'll understand why. I've also managed to secure an interesting new trial which will start either over the weekend or early next week. The service is called Racing Trends, and is run by a chap called David Renham, who some of you will know from the Raceform newspaper and his stints on Attheraces. The service is not a tipping line as such, but rather identifies a selection of meaningful statistical information for the day's racing. I'll say no more for now, except that a) we'll be sampling that over the next fortnight or so, and b) there'll be a free trial offer for you to take up, should you so wish. Lastly, on the subject of trials, I've been learning a thing or two about FX trading. It's not something I've previously ever been drawn to, but I have to say that Graham's posts on the subject are both informative and mouth-watering. He does an excellent job of leading us newbies (well, me at least) by the hand on a new adventure. No problem if it's not for you. This is after all primarily a horse racing blog. But I know from the last poll, that more than 1 in 7 of you are interested in FX, so those posts are for you. (By the way, if you haven't taken part in this week's poll question, you can do so by looking top right on this page for the Question of the Week). The weight for age discussion, which started a couple of days ago, produced lots of excellent debate from varying sides of the fence, and it is perhaps fitting that the last word should go to my buddy, Rob Pacitto. While not quite conceding his point (he never would, trust me! ), he has certainly taken on board our collective views. His comment is recorded below, and the whole discussion can be seen here. 1) F1 proves that, whatever other factors influence speed, a little bit of weight still makes a little bit of difference. Sure, it varies from car to horse, from one horse to another, from one race type to another, and the horse might not feel or realise it, but itâ€™s still there. 2) If WFA makes no difference, then itâ€™s pointless. If WFA makes a difference then it is unfair. So either way it should be scrapped. Just my opinion of course, among an impressive array above. Yesterday's racing was more than a bit frustrating for yours truly. Having passed on a good word for a horse called Arcano in the first at Newbury, I also told you that I strongly fancied Apple Charlotte in the third race. A small interest bet in Arcano was rewarded at odds of 7/2, but a much fatter wager on the Apple of 'Sir' Henry's eye was lost when a filly in the care of Luca Cumani, called Splashdown, burgled her right on the line for a short head verdict. Dash and botheration... (were two words I was not heard to explete). Today's racing looks fun with Sandown and York taking centre stage this afternoon. There is a strange draw bias in the 1m4f races at York, where - in decent sized fields - you really need to be drawn in single figures. Those with a wider draw get fanned out towards Harrogate and have little chance (apologies to all Yorkshire readers for my doubtless errant geography). For that reason, I've sided with Harry The Hawk in the concluding apprentice handicap. It's my conjecture that the bias will be amplified by the young inexperienced riders and, as such, I think Harry - ridden by the very good Slade O'Hara - has a fine chance from the 4 box. Spirit of Adjisa would also be of interest from trap one, with Charles Eddery an effective pilot in this peer group. The favourite, Joe Jo Star, has a chance from 8, but is plenty short enough in the betting, and not a play for me. Also racing today is dear old Night Orbit. I couldn't make it to Liverpool this evening, but I will be absenting myself from whichever hostelry I'm parked in shortly before 8.20 tonight. I make the race a four runner affair, between Quell The Storm, Gonebeyondrecall, Starr Flyer and Orbit himself. To be honest, I reckon the Irish raider, Gonebeyondrecall is the likeliest winner. But I'll be disappointed if Orbit isn't in the three and he looks a very good each way / place wager. So here we are at Thursday already, dear reader, and another week seems to be fizzing by without me noticing... I've got a packed post today, including the great weight for age debate; The Life System; the man with the most bulging eyes in the universe; and a Night Orbit update to boot. Some excellent points, and I'll try to look into the effects of weight in handicaps, by race distance, and by going. Incidentally, the research I did was based on flat racing. It seems a little unseasonal to undertake similar research for NH races, but again - at some point (if I remember) - we can look at that too. I have the technology! One or two (actually, more like eight or nine) of you have been asking me about The Life System, and whether it's any good. I've had a copy since Monday, and I've the following observations. It's certainly an interesting system, taking as it does a 'dutching' approach to the racing. That is, it advocates betting more than one horse in a race. Now, of course, I'm not going to give the game away here, but suffice it to say that this system WILL find big-priced winners. My advice regarding this system is, despite the threat of price rises, to hang fire and check the results. If the results are good, and it costs Â£15 more, I think that's better than paying Â£15 less and the results being not good. I've had a quick squint at today's racing, and there's one I have a fancy for later on. Before that, though, I can pass on a good word for a horse called Arcano in the opener at Newbury. It's been working very well ahead of debut today and, if getting the hang of things first time up, is expected to run well. The one I really like though, in the 2.40 at the same venue, is a course, distance, grade and going winner. Apple Charlotte ticks a helluva lot of boxes actually, and if box-ticking is your route to betting (as it often is mine), then she's got to be of interest. Although circa 11/8 is not everybody's mug of Tetley, and today's race has a number of unexposed young ladies preparing to reveal a bit more leg (sorry, lost myself in an exposure analogy there! ), I think 'Sir' Henry's filly looks spot on, and will be punting accordingly. Moving on to tomorrow's racing - hang on Matt, we haven't even started today's racing yet! - and Night Orbit is taking the looooooooooooooooooooong trip up to Aintree for a novice hurdle. It's a step up in class and in trip; I'm not certain the flat track will be in his favour; and he has to concede 7lbs to some dark ones further down the card. Moreover, there are some sneaky Irish raiders in the field that, as they say, could be anything. And... as a last time out winner, he's likely to be overbet and therefore represent no value. Despite all of these negatives, I'll be punting him as I am honourbound to do. And, should he have a chance on the run-in, I'll be hollering to the fullness of my lungs' capacity! The one thing Night Orbit does have in his favour is that he's a tryer. He's a little bit slow, but he's definitely a tryer. Finally today, as the fourth day of the traditional working week, named after the Norse god of war (I think), Thor, it's time for some Thorsday Fun. And I was reminded the other day of the legendary Marty Feldman, and his ridiculous and utterly brilliant 'Just One More, Please' sketch. Alas, not for the first time I wasn't able to find it on the web, so can't share it with you. Many thanks, dear reader, to the number of you who emailed me about yesterday's tardy email regarding the chances of Night Orbit, the beast co-owned by me. I had said he was fancied and indeed he duly romped home at a tidy enough 5/2. Alas, in order to communicate with you I'm required to use something called an autoresponder: this is simply an email sending contraption, and I have to say it is a very good one at that. But... occasionally, presumably due to the number of other people who also use the device, my notes to you get jammed in the pipe and can sometimes take up to two hours to arrive. They normally get to you within ten minutes. The truth is I didn't send yesterday's email until 1pm, as I'd been out enjoying my Sunday morning (as I hope many of you were too). I thought it only fair to mention that the horse was running, seeing as I know many of you look out for the old mule and are almost as invested in him as me! Well, the note arrived - depending on which email I pick from the virtual postbag - somewhere between 2.08 and 2.17pm. The race of course was at 2pm. As you mostly correctly identified, this was as useful as a chocolate teapot or a beach hut in the Arctic.
" Thanks for the tip, I have a horse running in the 3.20 Fakenham called Rackalackey and the trainer said he should win, the danger might be Leopold so do a reverse forecast as well - just in case. Seriously, I was gutted that the note didn't get to you in time. Orbit actually fair bolted up, with the slightly stiffer track, tackier going, and longer trip all playing to his strengths (i.e. stamina over speed!). The horse in 2nd was Dinarius, beaten eight lengths, and he was rated 122, with a well backed McCoy ridden debutante (strong flat form) back another four lengths in third. It was 30 lengths and more back to the rest. The proximity of the highest rated jumps horse and the best backed horse gives the form a solid look, and it's possible that Orbit might be rated around 120 in due course over hurdles. He's definitely found his metier, having struggled to catch slightly quicker animals over inadequate flat race trips, and - as a novice, and if the tracks stay soggy - he'd be capable of winning a couple more novice hurdles and perhaps a handicap or two in due course. Whether you got on yesterday or not, there look to be further races to be won by 'mighty' Night Orbit! Now, partially by way of apology, and partly because I was going to it anyway... ok, mostly because I was going to do it anyway, but it's turned out to be timed rather well... I've got a week of freebies for you. As well as the The Insider sports betting magazine that you can trial for free here, I've got a load of trainers to follow in the next few weeks, and two interesting systems that work especially well in low grade races (of which there are many!). Now I know the last three are currently in negative equity for this month, and that - consequently - a leap of faith is required. However, Henry Candy's runners are all performing creditably and, with a modicum more fortune, he would be nicely in front again. His string are clearly well. Peter Hiatt is something of a speculative inclusion, and one might be a tad more circumspect with one's staking with this chap's runners. When they win, they are bigger prices. But they don't win so often. Finally, my old mate David Elsworth will be banging them in again soon. His record at Newmarket is particularly impressive and, along with John Gosden, I always look for his runners there. Tomorrow, I'll bring you a little system that's done very nicely over the last few seasons; Wednesday we'll take five more trainers; Thursday another system; and, Friday, a further five handlers to follow. 33/1 Winner: ‘Niche Work’ If You Can Get It! So, back to work for many of us today, dear reader, after what will hopefully have been a refreshing and perhaps even a profitable Easter weekend. Although my Night Orbit could only manage 2nd behind odds on Sam Lord at Plumpton, he was 7/1 and rewarded each way support comfortably. I had an email from Julia Feilden this morning telling me the plan. Basically, he may be stepped up in trip for his next hurdles run (he finished full of running), but that will not be until after May in order to protect his novice status. He'll probably run on the flat before then. Up at Musselburgh, the draw selection Rothesay Dancer, sent off 10/1, managed to find trouble in running and finished 4th, just out of the each way places, and beaten just a length and three quarters (never nearer). But of course, as many of you know, the real 'juice' over the weekend was in Ireland, where Niche Market stayed on resolutely for Dorset trainer Bob Buckler, and regular pilot Harry Skelton, to land the Irish Grand National at fat odds of 33/1. It was heart warming for both Gavin and me to read about so many of you having tenners, fivers, two quids, whatever... some money on the Niche. And, better yet, most of you had availed yourselves of two or three times the SP using the betting exchanges. The comments from yesterday's post are well worth a read if you haven't already - click the link back to the post at the bottom of this one. I won't tempt fate by trying to find a winner today (nothing floats my boat), but suffice it to say that for FRP members, there will almost certainly be some draw action tomorrow. For those of you who don't read Gavin's blog at Nag Nag Nag, WHY NOT?!!!! Haha, only joking. What I meant was that if you don't read his blog, you may not know about the brilliant freebie he's giving away, with more of the trends action for this week's Newmarket meeting. The races at Newmarket feature the European Free Handicap, the Craven Stakes, and the Nell Gwyn Stakes, all of which are traditional trial races for the 1,000 and 2,000 Guineas. To get your copy (I've had a look and it's the same great stuff he produced for Cheltenham and Aintree, but for the flat), just pop over to this page and grab it. Finally, and I know this won't appeal to all, I wanted to quickly mention the only other service (aside from FRP) that I run, called Laying System. It's actually a members' service, where you log in to the members' area each day to get the selections. And, as the name suggests, we're looking at horses to lay, not back. You can have a look at the results here. If you like what you see, and would like a gratis 7 day trial to see if its for you, then just click this Laying System link. Remember, as with all trial periods, it's important to 'paper trade' (i.e. see what would have happened without investing any cash) before taking the plunge. https://www.geegeez.co.uk/wp-content/uploads/2018/09/geegeez_banner_new_300x100.png 0 0 Matt Bisogno https://www.geegeez.co.uk/wp-content/uploads/2018/09/geegeez_banner_new_300x100.png Matt Bisogno2009-04-14 09:35:212009-04-14 09:35:2133/1 Winner: 'Niche Work' If You Can Get It!